Hello guys! I want to share something that's hopefully useful to a lot of you. 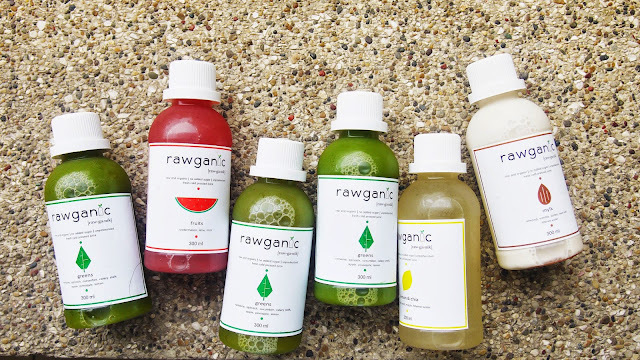 I just finished my 3 day juice cleanse using products from Rawganic. This was my first time so I did not know what to expect. So the drill is, the past 3 days I've only consumed 18 bottles (6 bottles each day) of cold pressed juice from Rawganic and water. That is all. No solid food whatsoever. I decided to do this because I'm trying to get healthy and I felt like it's an easy start. I'm also trying to cut down meat. I did not know anything about juicing, great recipes and stuff so I decided to pay someone to take care of everything for me. They did not disappoint! 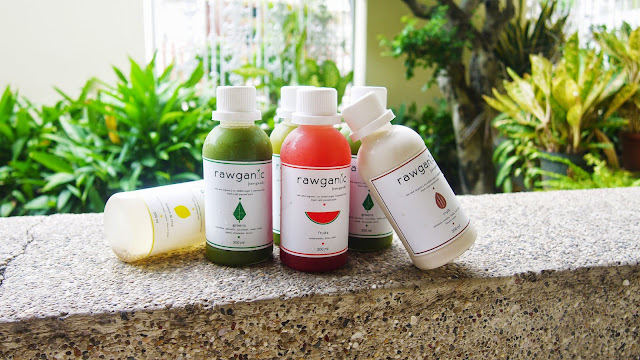 Rawganic gave me 3 options of cleanses, and I chose their advance cleanse which consists of 3 bottles of greens, 1 bottle of watermelon, 1 bottle of lemonchia, and 1 bottle of almond mylk for a day. Each bottle contains 300ml of product. They have a lot other options but this cleanse has the most vegetables in it so I picked that one. They also serve a bigger size, which is 500ml per bottle. For what I got, I paid IDR720,000, which is not cheap. Next time I'm doing a juice cleanse I'll probably try to make everything myself. I did not do a pre-cleanse, which is the first thing that I did wrong. From what I read, it's best for you to prepare your body before doing a juice cleanse because you'll be feeding your body nothing but liquid, so to make sure your body won't go into total shock you should try to ease your body into it. I will probably cut off meat altogether for the next few days for a post-cleanse for the same reason. So anyways, you are supposed to drink your first bottle of the day at around 9 to 10 am and then drink the next bottle 2 hours after the first one. Don't worry, all the bottles are numbered. In between, you're allowed to drink plain water or lemon infused water. Here are what's inside each bottle and what I think about them, taste-wise. 1. Greens: Romaine, spinach, cucumber, celery stalk, apple, pineapple, lemon. This one is surprisingly my favourite! Imagine the hell I would've gone through if I did not like this one, haha. Never in a million years I thought I was going to like green juice. It tastes 'healthy' but also tasty. It does not taste like drinking grass, at all. If someone as unhealthy as me likes this then you must like this too! 2. Fruits: Watermelon, lime, mint. I hate mint. I hate hate hate mint. I don't like mint flavored candies, anything. It just tastes like toothpaste to me. Fortunately, the mint wasn't overpowering. I could still enjoy this although it's my least favourite (only because of the mint). I'd enjoy this more without the mint. I haven't asked them if we can ask for a custom recipe in the bottles but if you don't like something you should ask! They're really nice. 3. Lemonchia: Lemon, chia seed, maple, filtered water. It's just what it is but yeah, I liked it. 4. Mylk: Almond, vanilla, dates, sea salt, filtered water. 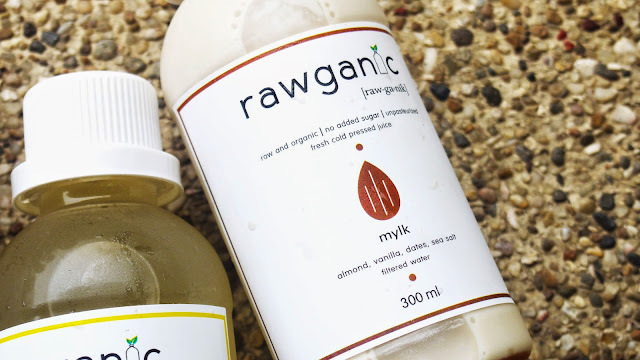 Best almond mylk I've ever tried. One bottle was more grainy than the others but other than that, amazing. 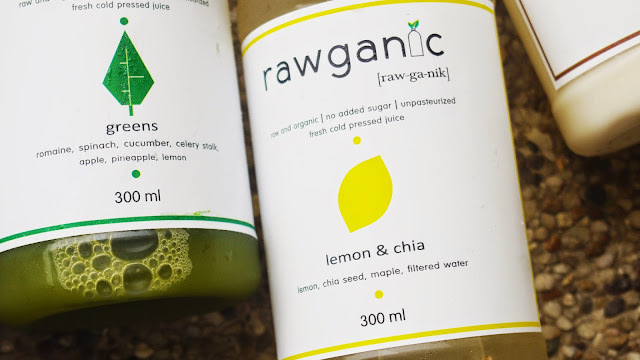 Everything is raw, organic and contains 0 added sugar. I'm so proud of myself that I did not cheat! Yay me! Although I did not stick to the schedule and sometimes I was late to drink the next bottle but other than that, everything's good. Well, the first day was the hardest. It was also my first day of period (TMI) and my tummy was hurting so bad. My body did go into a state of shock I think, and I felt drained, I could not do anything. I got a bad headache around the afternoon but it got better. The second day, I could really feel the rush of energy. They say that the energy that's usually used to digest food now is unused and it makes you more productive. It's true. I felt like I had a clearer head, I could think more, like I knew my brain was working. I got to write what ended up to be the most viewed blog post from my blog in just one day. I felt fresh, lighter, and happier. I was conscious that I was giving my body a lot of nutrients instead of junk, it made me feel good. I finished the cleanse with much clearer mind, and more convinced to start a healthier lifestyle.